Perfect stay again & great hosts.. The timings usually go up a few days before the tour runs. Rannoch Station is perfectly situated just five miles from the guesthouse doorstep. You can arrive to the Bridge of Gaur refreshed, relaxed & in time for breakfast ! Travel from London on the Caledonian Sleeper which operates from London Euston all year round. 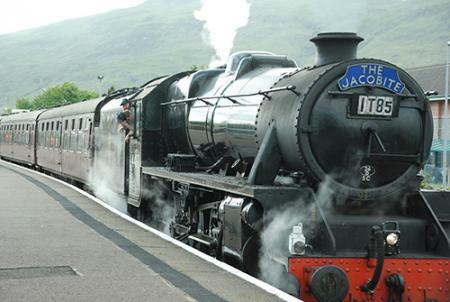 While you are here from the station take a scenic trip through some of Scotland's most beautiful and wildest scenery to Fort William and then onto Mallaig on the West Highland line. From Fort William continue onto Mallaig on the Jacobite Steam train. The train journey from Fort William to Mallaig has been has been reviewed as one of the top ten train journeys in the world as recommended by the BBC. The train journey to Mallaig will take you over the famous Glenfinnan Viaduct - 416 yards of raised track over 21 supporting arches, seen in many films but most recently as the Hogwarts Express from 'Harry Potter' travels over on its way to Hogwarts. The journey continues through, Arisaig, Moror and onto Mallaig. Once in Mallaig, you can spend some time and return in a day or spend the night and return the next day. Or use it as a stop over as you continue your holiday over to the Isles. Steam train enthusiasts can also see the The Royal Scotsman travelling through Rannoch Station on many of its tailored luxury journeys. THE "Royal Scot" is a train with a tradition that began nearly seventy-three years ago. It was on June 1, 1862, at 10 a.m., that the great express first left its southern terminus for Scotland, and ever since it has drawn out of London at the same hour.